Liz Maly is an architect, designer, and craftsperson. She runs Felt Cafe, an online boutique that sells all kinds of interesting things made from felt. Ms. Maly makes each unique piece by hand using soft, fluffy merino wool. 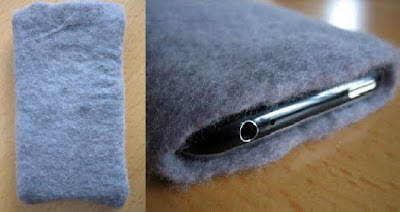 The technique is simple and natural; the wool fibers are fused together using hot water, a bit of dish soap, and friction. Also, check out Felt Cafe's etsy shop for all kinds of assorted crafty goodness. If you're considering gift possibilities, remember that nothing says you care like layered and compressed wool.